I returned to the Agawa Campground to paint with my Huntsville artist friends. We all set our gear up on the beach although it was certainly not beach weather. 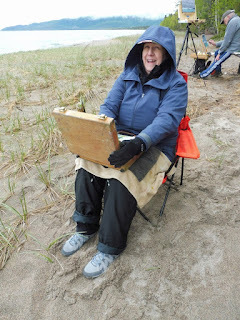 Plein air artists are hearty souls and we had a blast. Everyone had their winter coats on. Of course I would have had my winter coat on if I had been smart enough to bring it. It might have been June but I should have packed my winter gear. I decided to paint looking northwest to the headlands that housed the Agawa Rock Pictographs. Sinclair Cove was just around the corner to the north. 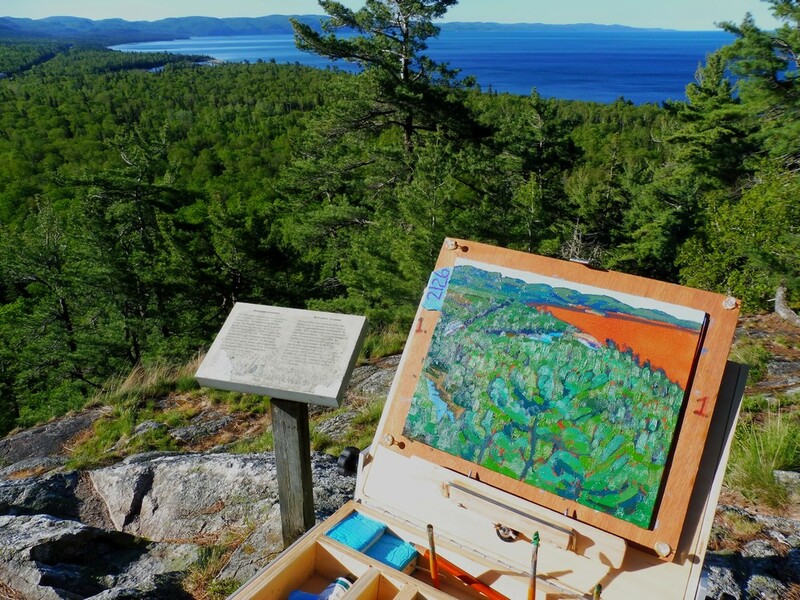 There were a couple of characteristic islands that dotted the landscape off Agawa Rock. They caught my eye. Streets of turbulent stratocumulus covered the sky. The sun peaked through between the cloud streets every now and again and the solar radiation felt wonderful on my back. The waves were crashing on Agawa Beach. We were all alone and the campground was virtually empty except for us artists. I used the correct spelling of the Ojibwe name for Lake Superior. The Ojibwe name for Lake Superior is actually gichi-gami which means "great sea" or "huge water". Henry Wadsworth Longfellow wrote this name as "Gitche Gumee" in his 1855 epic poem "The Song of Hiawatha". Apparently this spelling was learned from Henry Schoolcraft, who worked with the Ojibwe people at the time Longfellow wrote the poem. The 1878 Ojibwe language dictionary by Father Frederic Baraga says Lake Superior is Otchipwe-kitchi-gami - the sea of the Ojibwe people. The "i" at the end of gami would be more like the "i" in "it" than a long "e" sound which was used in Longfellow's poem and Lightfoot's classic "The Wreck of the Edmund Fitzgerald". Gordon and his band recorded his 1976 song in the first take. The Edmund Fitzgerald sank at 7:10 pm on November 10, 1975 with the loss of her entire crew of 29 men on Lake Superior about 17 miles north-northwest of Whitefish Point, Michigan. Whitefish Point is the site of the Whitefish Point Light Station and Great Lakes Shipwreck Museum. The two life boats were found smashed up on the shore. #2133 "Birches and Black Spruce"
This is the view looking inland from the boat ramp leading into Sinclair Cove. It was 8:30 am on Monday June 4th, 2018 and I had all day to paint. I picked this smooth panel with the intention of completing this early morning painting and then returning to the Agawa Campground to paint with my Huntsville artist friends. I did not want to wake them up too early. The black spruce were interwoven with the birches and poplar to make an almost impregnable screen of trees. This time a picked a very rough, small panel to capture the impression without too much detail. I might have been wearing my glasses. I included the Provincial Park sign as some stabs of paint on a post. I did not see a soul at the cove on the cold and cloudy day. 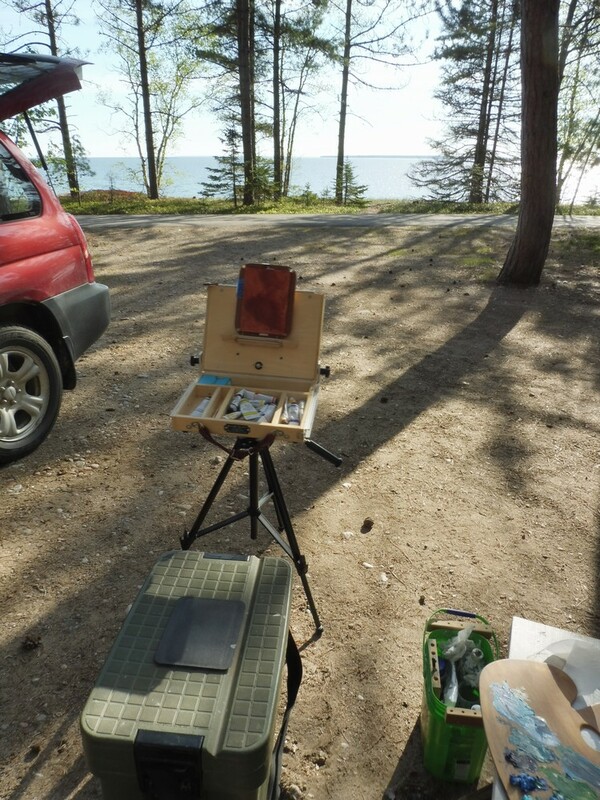 I woke up at 6 am at my Agawa campsite in Superior East as has been the habit on this painting trip. Within minutes I was in the car and traveling back to the shelter of Sinclair Cove. The old Subaru Forester was much warmer than the tent. It was only 4 degrees Celsius outside according to the car thermometer. I should have been a better weatherman and ignored the climatological fact that it was June. I had packed my summer camping gear and should have brought my winter stuff. The damp from all of the rain made it feel even colder. 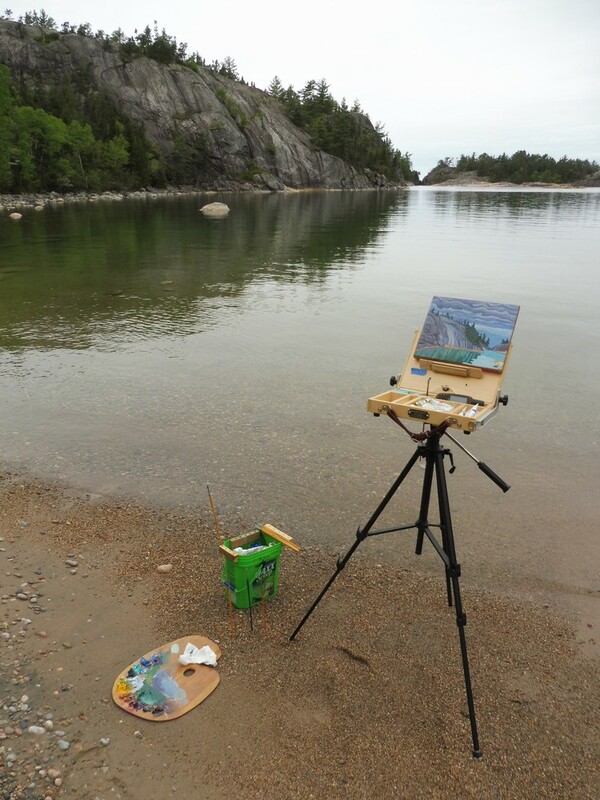 I had painted pretty much every island, tree and rock in Sinclair Cove except for this smooth knob of a rock in front of Sinclair Island. 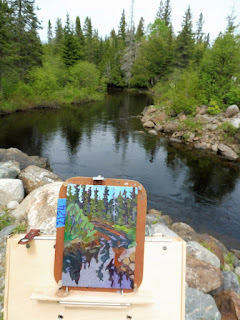 I picked a smooth panel with the intention of completing this early morning painting and then returning to the Agawa Campground to paint with my Huntsville artist friends. There was a lot of wind in the atmosphere. Long wavelength gravity waves dominated the altostratus skies looking northward from Sinclair Cove. 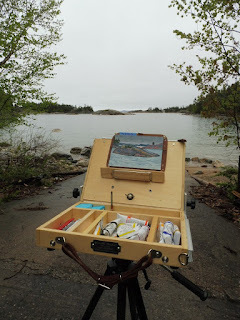 I painted in the shelter of the rugged shore of Lake Superior and barely felt any of these winds in the cove. The layer of cloud on the northern horizon was very interesting. I suspect it was thick advection fog over the cold waters of Lake Superior. I decided to grab a slippery panel and paint the home of Paradise Lost or was it Paradise Found. Regardless the structure was quite hidden in the trees. There was indeed a cottage on Sinclair Island although there was no sign of any activity. It looked like a potential paradise to me but perhaps it was too early in the season. The cottage was probably uninhabited save for perhaps a few weeks in the hottest part of the summer. The trees had grown up and the structure was barely discernible. The bugs were getting a bit more persistent. I used the mini head net when the black flies persisted on landing on and behind the lenses of my glasses. I do not get too many bites but still a few. Apparently ticks are not a big concern around Lake Superior yet. The frontal surface was lower and the rain was getting closer. There was a lot of wind in the atmosphere. Long wavelength gravity waves dominated the altostratus skies looking northward from Sinclair Cove. I painted in the shelter of the rugged shore of Lake Superior and barely felt any of these winds in the cove. The rain started at 10 am just as I was finishing up. 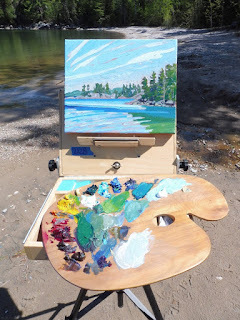 My plein air painting was done for the day. The rain was even heavy at times. I decided to drive through the Superior East Provincial Park looking for painting material and locations. I ended up in Wawa. 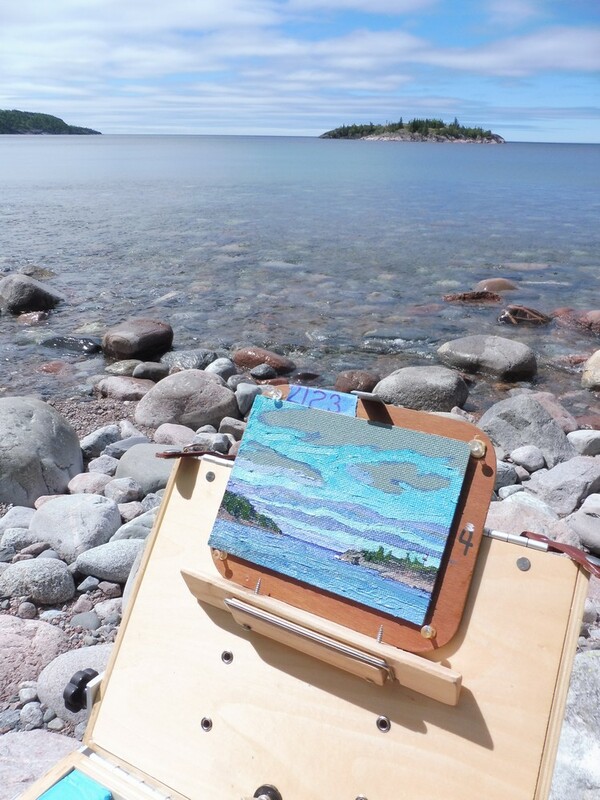 I even toured Michipicoten just south of Wawa which is where my friend Lawrence Nickle did that painting that I own. 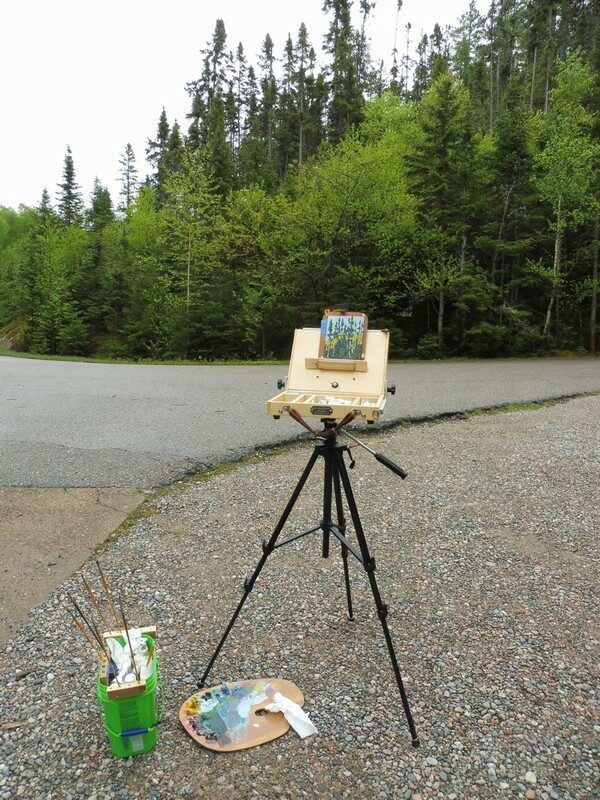 I woke up at 6 am at my Agawa campsite in Superior East as has been the habit on this painting trip. Within minutes I was in the car and traveling up Frater Road. The car has a heater and the tent does not. 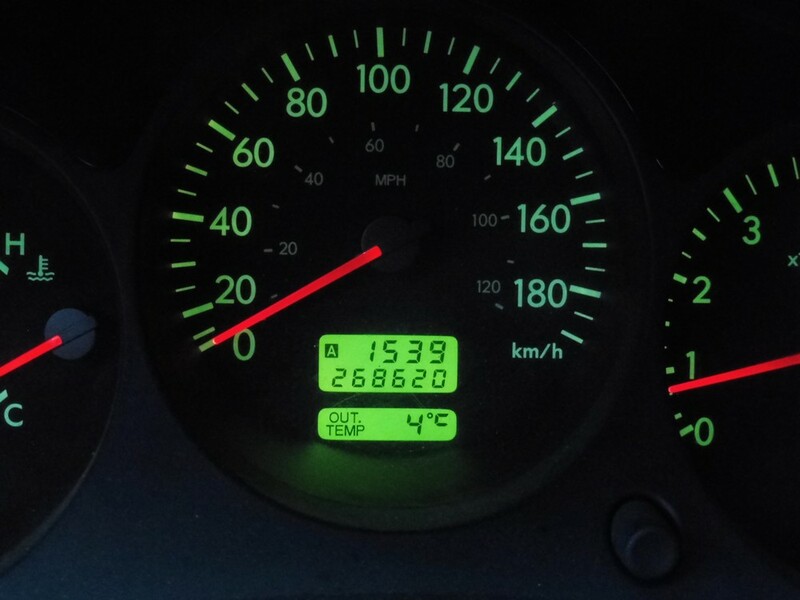 The car measured the outside temperature at plus 4 Celsius. It felt colder and I had the car heater on full tilt to compensate. I was told that it was very scenic in Frater and I had to go. The roads were constructed out of glacial till. The round rocks were sometimes huge like boulders and the rain from Alberto had washed the sand from around them. The round rocks made the road very rough. I drove up to the Village of Frater. There were a few old and empty looking houses and three big trucks parked outside. I saw two bull moose on the railway tracks that went through the centre of Frater. The huge moose simply dissolved into the fog and the drizzle when they saw me. There were several outhouses so I don't think any of these houses had hydro or running water. I would have painted something in Frater but the precipitation was far too heavy. 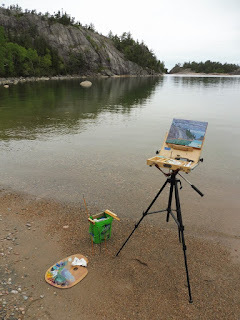 I headed back to Sinclair Cove to paint in the sheltered bay. I finished the first painting of the shear rocky Agawa cliff by 8 am. The gravity waves in the bottom of the altostratus told where the warm frontal surface was but it was not raining at the cove yet. The drizzle had lightened up and painting was possible again. The dark nimbostratus looking cloud on the northern horizon foretold of what was to come. That sunlit edge to the nimbostratus was a deformation zone. The patterns on the water of the cove was a mix of reflections and calm and rippled water. It was Saturday evening at my Agawa campsite in Superior East. The paint was drying on my palette. It was a case of either use it or lose it. Those oils were really expensive and I choose never to waste anything. I was too tired to go anywhere. I had been hiking and painting all day. 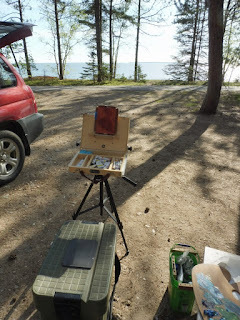 So I just painted from Campsite 102 of Agawa looking outward across Lake Superior toward Montreal Island past the stand of red pines on the shore. That is Montreal Island way out from shore to the right. The wind had been easterly and offshore all day but just around 6 pm they shifted to the southwest. The black flies had started to be irritating but they backed off with the cool marine breezes off the lake. I did not plan to go swimming. The water had to be near 4 or 5 Celsius - way too chilly for me. This little patch of green was a busy spot all day. Cedar waxwings, slate grey juncos and yellow warblers all found something to eat. The cedar waxwings were swallowing small reddish berries. Supposedly the juncos were after the seeds and the warbler was left to dine on bugs. Everyone got along just fine. This scene was backlit so it was all about using up the paint and getting the tones right. Colour was secondary. 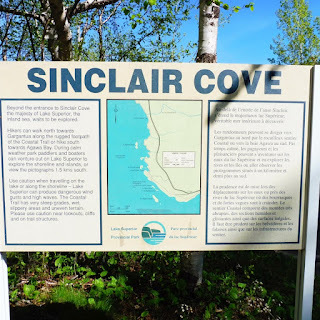 I headed north to Sinclair Cove of Lake Superior after leaving the Awausee Trail. I wanted to return to a painting of more sky than trees. The shore of the cove looking northward was the perfect opportunity. There were also almost no biting insects in the cooler, marine environment. There were even fewer people. The cirrus was being stretched out with the upper winds. Another weather system was on the way. Sinclair Island was the large island to the northwest of the cove. The Agawa Rock Pictographs were just to the south of Sinclair Cove. As I painted I witnessed the strangest thing. I heard a buzzing like a hummingbird. Above my head was one hummingbird perched on a small twig with a second hummingbird buzzing back and forth in front of it in some kind of frantic and dramatic aerial display. After a few seconds they both buzzed off together flying like mini jets through a thicket that I couldn't even see through. The 1878 Ojibwe language dictionary by Father Frederic Baraga says Lake Superior is Otchipwe-kitchi-gami - the sea of the Ojibwe people. The "i" at the end of gami would be more like the "i" in "it" than a long "e" sound. The Canadian iconic singer and song writer Gordon Lightfoot followed Longfellow's lead in his 1976 song, "The Wreck of the Edmund Fitzgerald" which sank at 7:10 pm on November 10, 1975. The Edmund Fitzgerald was lost with her entire crew of 29 men on Lake Superior about 17 miles north-northwest of Whitefish Point, Michigan. Whitefish Point is the site of the Whitefish Point Light Station and Great Lakes Shipwreck Museum. The two life boats were found smashed up on the shore. I was up at 6 am with the sun at my Agawa Bay campsite on the shores of Lake Superior. I started out early to hike a bit of the Awausee Trail. I was told there was a nice pool and waterfall up there. It sounded like something very worth painting. I had both hands occupied with my easel and paints. 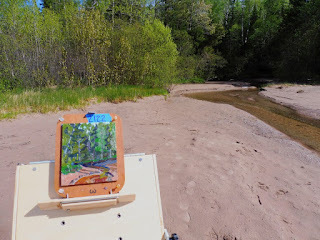 The trail went straight up but it would have been fine if I had taken my smaller plein air kit. Next time. I found this little woodland pool along the trail on the way back from painting #2126 "Superior Awausee Lookout" at the first lookout on the Awausee Trail. The hungry mosquitoes found me as well and really hurried me along. The sound of the water trickling through the tree roots was music to my ears. The huge tree and roots clung to the rocks and kept as much soil as they could on the steep slope. Mossy and lichen surfaces were everywhere. It was almost like a rain forest setting. There are more than a few bugs mixed in with the thick paint that I applied to the very smooth and slippery surface. 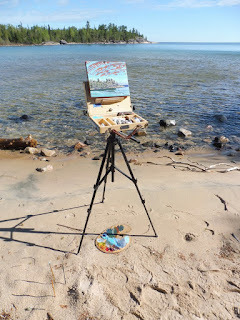 As I painted I wondered how long it would take for this tropical moisture to reach the ocean again. Does anyone know? Note that I use a roll of masking tape to keep track of the specific number of the painting that I am working on. I display this piece of tape with the right number on my easel as I paint. When completed that little piece of tape is then stuck on the back of the painting. New numbers are written on the roll of tape as I tear off numbers with each new painting. It is a simple system and it took me years to figure it out. I was up at 6 am with the sun at my Agawa Bay campsite on the shores of Lake Superior. 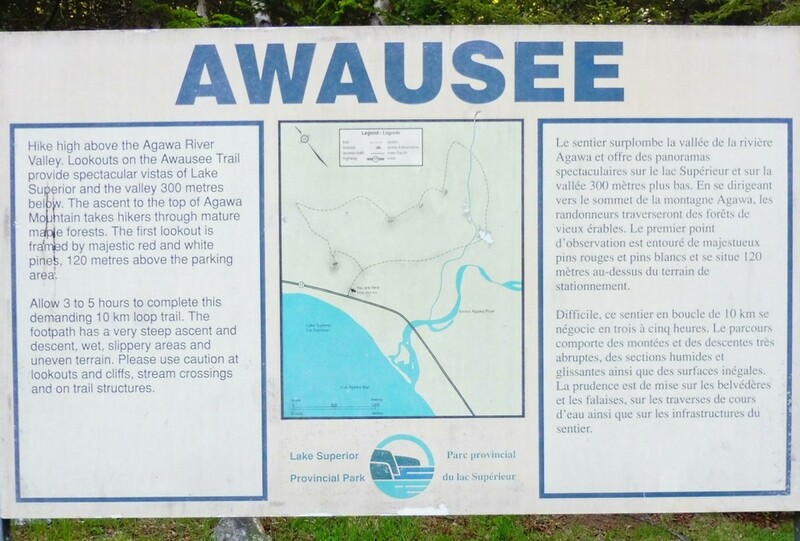 I started out early to hike a bit of the Awausee Trail. I was told there was a nice pool and waterfall up there. It sounded like something very worth painting. 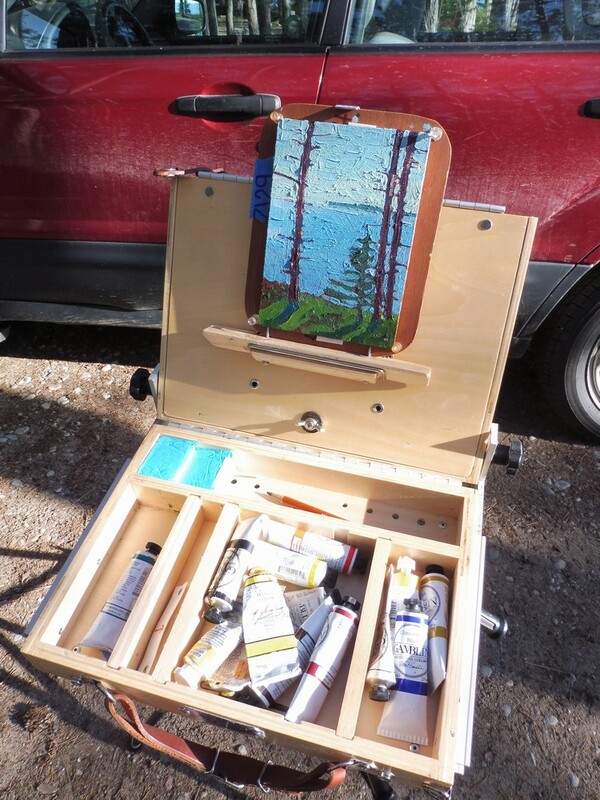 I had both hands occupied with my easel and paints. The trail went straight up. It was rocky and the steps when there were any, were very high and not an even 7 to 8 inches as prescribed in most building codes. The trail would have been fine if I had taken my smaller plein air kit. Next time I will know. The first lookout was indeed a full 45 minutes along the vertical trail and time I should really have spent painting. I still got painting by 7 am at the outlook overlooking the scene below. The cliff was steep and it would have been a nasty fall. The rocky cliffs were still wet with the rain from Alberto. The location was potentially treacherous. I was bit uncomfortable painting from the lookout. The scenery was beautiful though and well worth the hike. As I painted I did see what might have been a golden eagle. A large flock of Canada geese came close overhead. 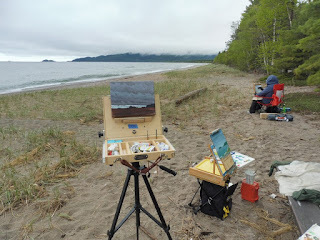 That was Agawa beach in the upper centre of the painting. 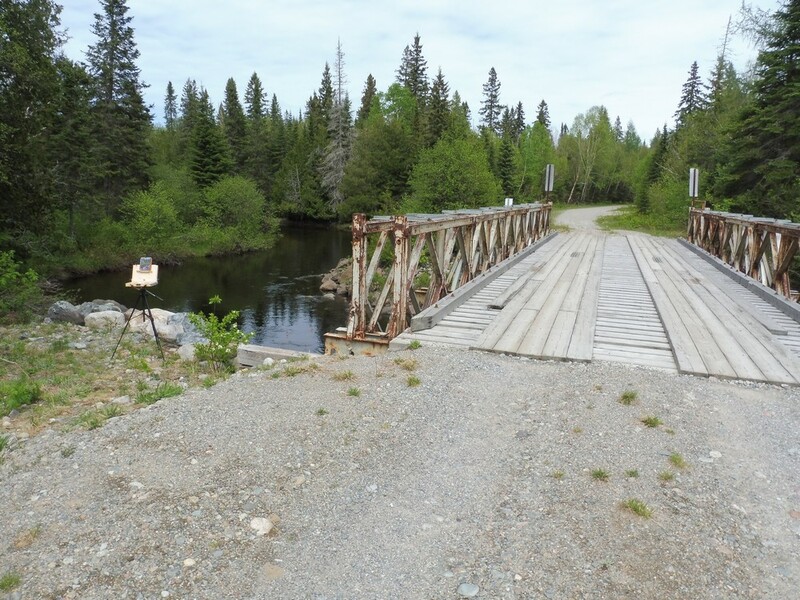 The steel bridge in the left centre crosses the Agawa River. 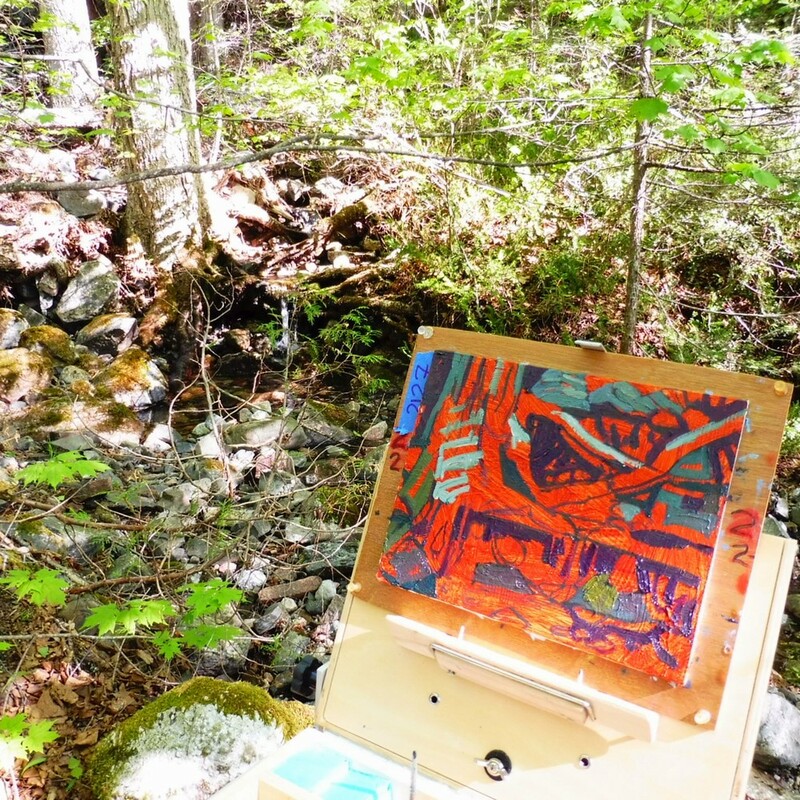 On the way back I did not find the pool but did sketch a little woodland pool along the trail. The mosquitoes found me and really hurried me along. 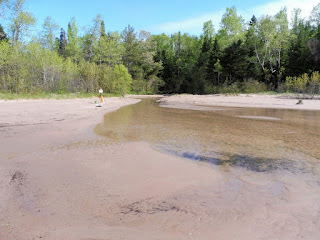 I was headed back to Agawa Bay Campground along the Superior East shore after spending the day at Gargantua Harbour. I decided to stop and paint a late afternoon water and rock scene. I did not want to waste a moment of my exploration just in case I don't make it back up here again. A.Y. 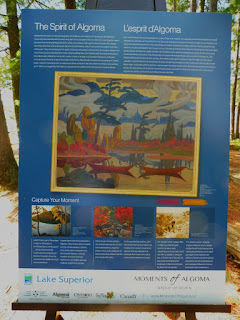 Jackson wrote, "I always think of Algoma as J.E.H. MacDonald's country. He was a quiet, unadventurous person who could not swim or paddle or swing an axe or find his way in the bush. 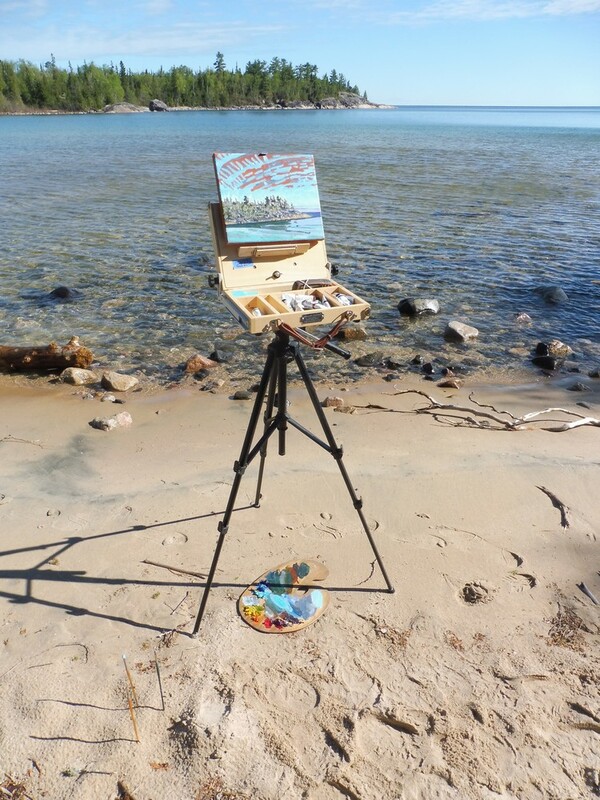 He was awed and thrilled by the landscape of Algoma and he got the feel of it in his painting." I always felt that Jackson might have been a bit harsh in these words. 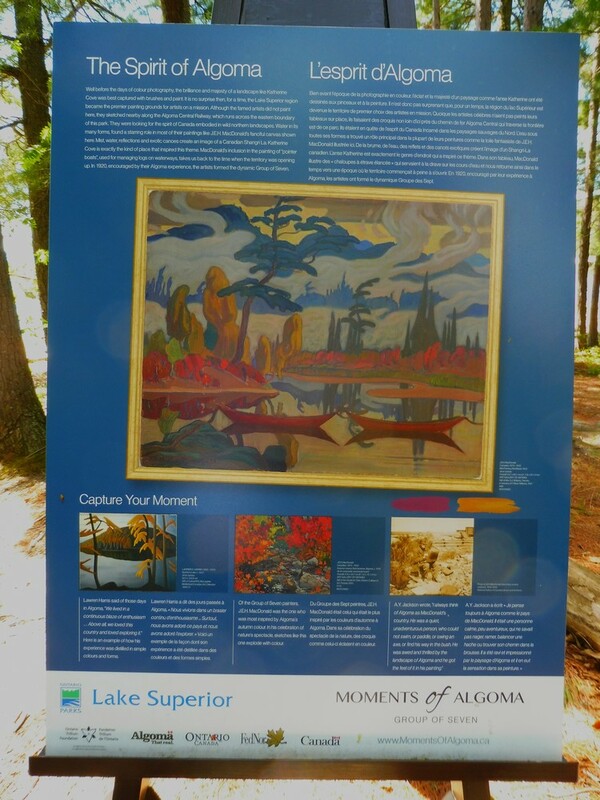 There has been speculation that MacDonald might have suffered a minor stroke while helping to build Tom Thomson's Cairn on Canoe Lake. It was hard work carrying rocks up that steep slope and mixing cement in the fall of 1917. MacDonald did suffer a significant stroke in 1931. He spent the following summer recovering in Barbados but died that autumn in Toronto on November 26, 1932 at the age of 59. He was buried at Prospect Cemetery in Toronto. Much too young. 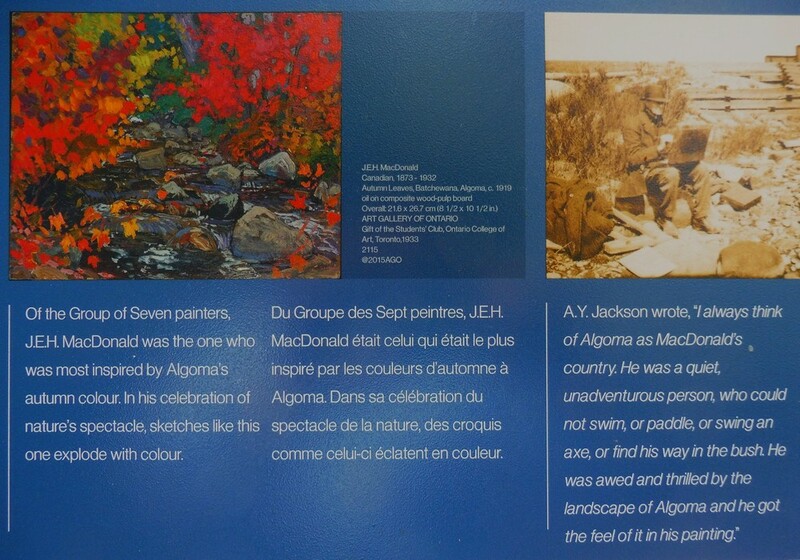 The autumn of 1918 was the first visit to Algoma by MacDonald, Harris, and other artists. 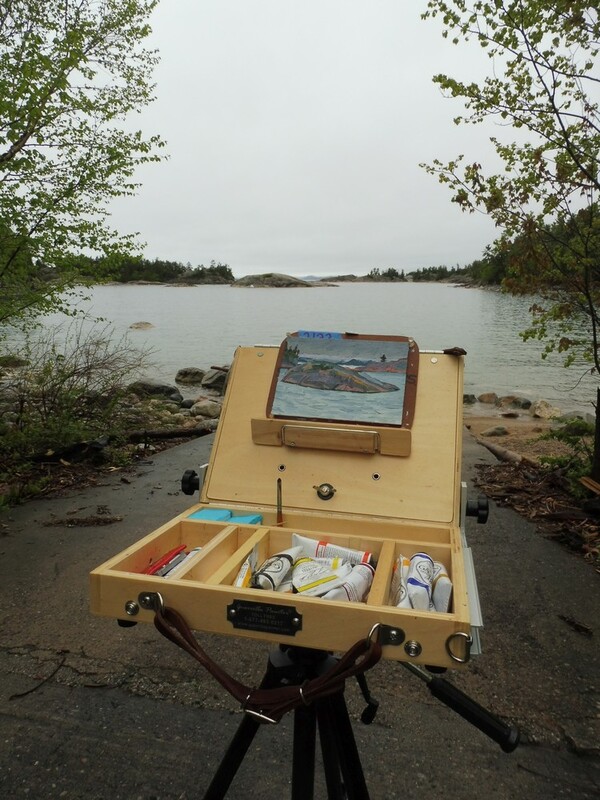 They used a specially outfitted Algoma Central Railway box car that functioned as a mobile artist studio. The group would hitch their car to trains travelling through the area. They would unhitch again when they found a scenic location where they would explore and paint that local wilderness. MacDonald returned to Algoma every autumn until 1923. These trips would produce some of his most acclaimed paintings, including Mist Fantasy, Sand River, Algoma (1920) and The Solemn Land (1921). 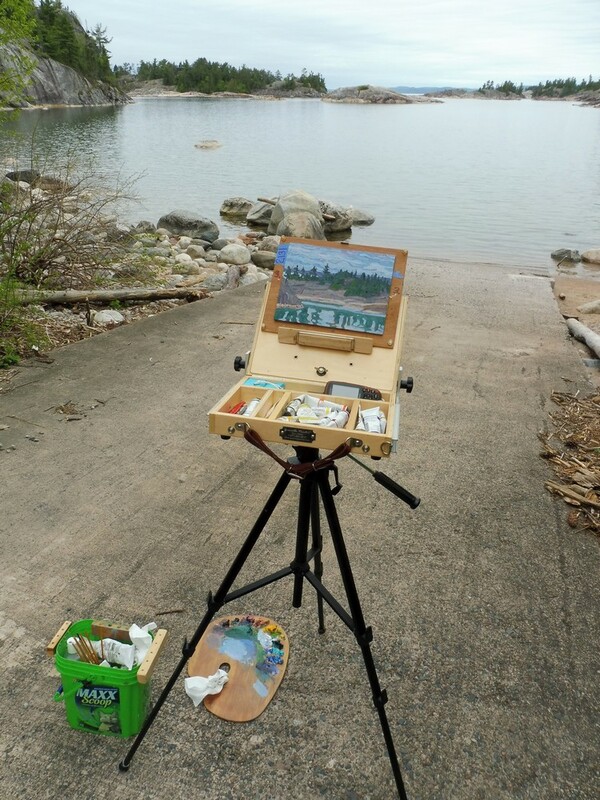 I was painting the same landscapes almost a century after that first box car trip. Those autumn paint escapes between 1918 and 1923 included Lawren Harris, A.Y. Jackson, Frank Johnston, J.E.H. 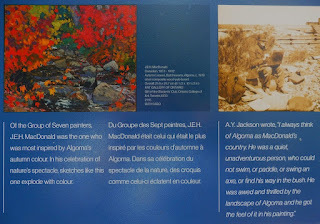 MacDonald and Arthur Lismer. In some ways I think the railway got them closer to the scenes than I got to by road. I did a lot of hiking. 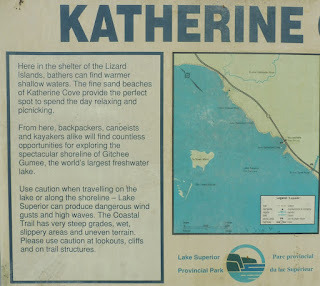 I started at 4:45 pm when I stopped at Katherine Cove. It was windy but the weather had really cleared. The altocumulus gravity waves were very interesting. There was a band of cirrostratus on the southern horizon - perhaps another storm but this one would miss us. The reflections of the point to the south was sometimes like a mirror but often dappled and confused when the breeze rippled the surface. Those rocks were really there on that point. 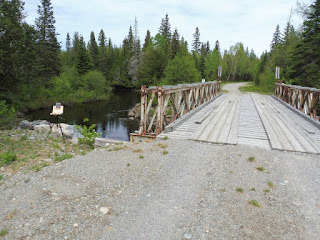 I painted artistic journey step number 2124 beside an old steel bridge on the Gargantua Road just west of Highway 17. There was quite a current and a lot of water passed under that bridge while I painted. The heavy rain from the post-tropical cyclone and the transitioned Alberto was still finding its way to sea level. That water was not coming back in our life time. #2123 "Rocky Entrance to Gargantua Harbour"
Gargantua Light was important. Without that beacon it was easy for ships to find the rocks of the eastern shore of Lake Superior. The cold water, fog and other threats to navigation make Superior a challenge. 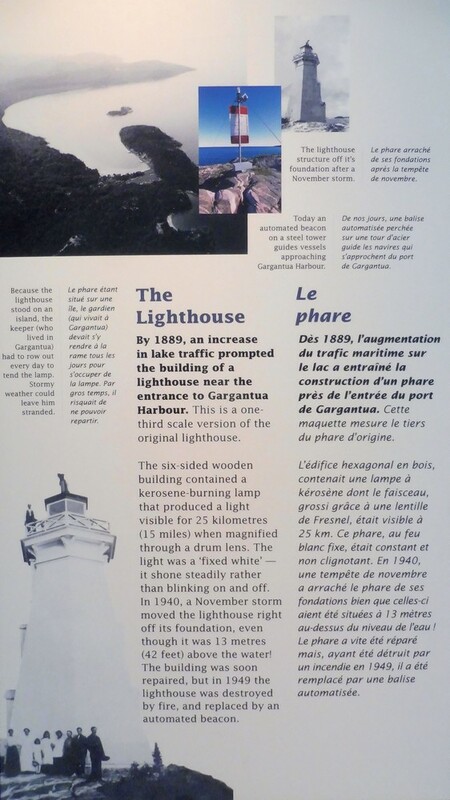 The light house started in 1889 with Louis Miron in charge. Three generations of the Miron family kept the light going until 1949 when the automated beacon took over. Louis' son Charlie was the second lightkeeper starting in 1912 with his son Tom taking over the role in 1943. 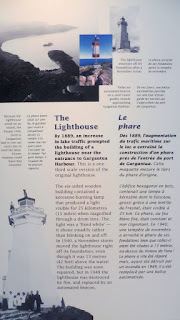 Apparently the lighthouse keeper's residence was the largest house in Gargantua. They rowed over to the island to keep the light on. The very rough panel did not allow much detail which was fine by me. The strong northeasterly winds created gravity wave patterns in the altostratus. Waves were breaking on the rocky points of the island. I was protected from those winds by the tall forest to my back. This is where I found the fishing lure snagged on a branch in the current. The stream carved a ever changing path through the sand on the northwest corner of Gargantua Harbour. The fishing must be good. At the peak of the hamlet of Gargantua in the early 1900's the village would have included a cookery, an ice-making building, a twine shed, homes for the fishermen and lighthouse keeper plus some cottages for the summer tourists. The population was seasonal but would have tallied a few dozen souls. It was surprising to me that a century later, all of that was gone without leaving much of a trace. The fishing lure that I found was new and probably off the shelves of Canadian Tire.